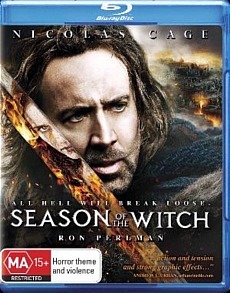 Nicholas Cage (National Treasure) stars in this clichéd sword and sorcery action adventure that is steeped in both paranormal and paranoia themes. The story begins with Behman (Cage) and his best friend Felson (Ron Perlman) fighting within the crusades and after Behman accidentally kills an innocent, this acts as a catalyst for Behman and Felson to leave their holy mission. When they return home, they discover that their country has been decimated by plague. As the plague cannot be explained, the church believes that a girl (Claire Foy) is responsible for this unholy disease and they condemn her as a witch. However when the powers that be discover that Behman and Felson are deserters, they are imprisoned for their crime and in order to find redemption, they become embroiled in the girl's curse as they are forced to accompany her to a remote monastery in order to rid the land of this curse. Joining the two former crusaders is a group of religious zealots from an altar boy with delusions of grandeur to an almost perfect Knight. However as their journey commences, they soon realise that there is more at stake here than just the innocent life of a girl who is controlled by a nefarious entity. One by one, they are tested by this entity and you can probably guess who will be the survivors. It's definitely a passé story and once again Cage plays the stoic character well with Perlman as his charming backup who plays the average man with some witty one-liners. There is some decent chemistry behind the two as there is with Claire Foy who plays the "witch" perfectly. Unfortunately Season of the Witch failed to make inroads within the movie industry and the biggest problem with the story is that it harkens back to the 80's style of sword and sorcery and although it attempts to take itself seriously, there are elements that will leave cringing. Directed by Dominic Sena, he does a decent job at recreating 14th century Europe and uses some quite amazing locales in the film such as Austria, Croatia and Hungary. Add in ancient armour, swords and everything else you would expect to find in this time period and Season of the Witch comes together rather well with some great action scenes as the weapons clash. The only drawback to the film are the special effects that at times look a little budget but fortunately the cast manage to move beyond this from the witty one-liners of Perlman and Cage. Video quality is quite gritty but supports sharp images and everything looks dirty which suits the story well. Audio supports DTS-HD 5.1 that boasts extremely clear audio with no hiss or any errors whatsoever. Dialogue and sound effects are mixed well and there is some good use of bass incorporated into the action scenes. There are a handful of special features that include Becoming the Demon, On a Crusade, Deleted Scenes, Alternate Ending and Original Trailer. The special features are nothing great but it does give fans of the movie a chance to see how it was created and learn some of the history about the crusades and the witch hunts of the era. In the end, Season of the Witch is a clichéd sword and sorcery romp that if it didn't take itself so seriously, would definitely be a more enjoyable. It's fun needless to say.